Marianna Kekebanos is an undergraduate student in the Bachelor of Fine Arts program at Illinois State University. Her practice focuses on forms and colors reminiscent of organisms living in the sea. Having lived most of her life in Athens, Greece her memory of the region serves as fuel for her paintings. Her connection to Greece, interest in the sea, and calm yet particular studio practice flows together and creates an interesting mingle of connections all revolving around home, place, and temperament. Our conversation often drifted to long breadths of stories from her childhood and her longing for the relaxed cultural atmosphere not lived in central Illinois. Upon walking into Marianna’s apartment, I was greeted by a small white and gray Shih Tzu named Cookie. He approached me with curiosity and kindness. Cookie’s nature immediately set the tone of the evening: welcoming. Walking into a lived space feels much different than walking into a space solely used for creating. Personal items lay about the living room; blankets, haphazard sneakers, and worn furniture occupy the space. To the left, a small kitchen is scattered with boxes, utensils, and used dishes. A lived space contains both fixed and temporary fragments of a person's identity. In Kekebanos's home objects carry a casualness. Kekebanos and her fiancé live in one of a hundred or so apartments located on a lot. Bright green, grassy lawns set apart the buildings. Her home is outside of Illinois State University's campus. Separation from the college is quite important. The calmness and stillness that hovers in the air is a reprieve from the cacophony of noise created by the clustered population on campus. The complex is quiet. Drawn to placidity she prefers the surroundings of a domestic place to one filled with activity and people because it “Just feels more cozy,” she says. Kekebanos takes advantage of the two-bedroom apartment, utilizing the spare room as her own studio space. We walk towards the back of the apartment where the spare bedroom is located. The first thing I notice is plastic. Large plastic sheets are tacked along one wall and spread across the floor. 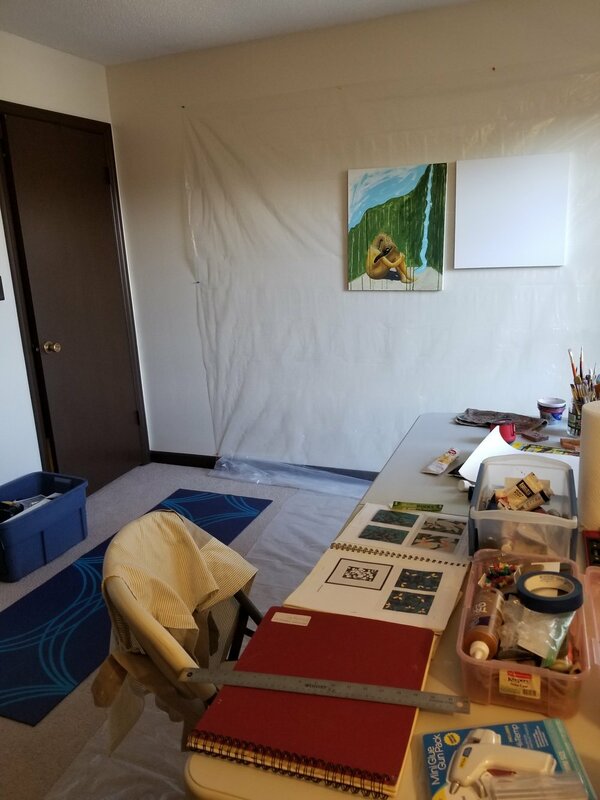 The room is sparse, with a desk containing only the essentials: paint, brushes, palette, pencils and paper towels. A white chair sits near the desk and a small easel stands in the corner of the room. A closet serves as a storage space for her past work. A few pieces of Kekebanos's studio stood out. The casualness adorned in her living room and kitchen do not spill into the physical forms of her studio. It is clean and pristine. In fact, no images or text were pasted to the walls, floor, or desk, instead a couple photographs of her family were displayed on two walls. 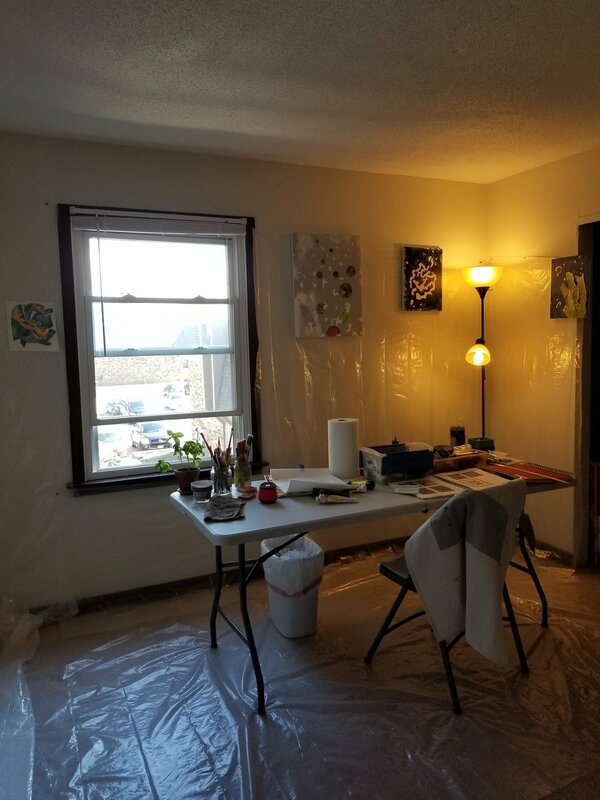 The cleanliness of her studio was not constricting my comfort, but merely shifted the apartment from a place of multiple activities to a room that is pared down and organized. Her soft and kind demeanor filled the space with a fresh warmth. A single window was opened allowing the day’s breeze to make its way through. A small basil plant sat underneath the window soaking in the sun. A rich blue yoga mat with crescent baby blue lines lies unraveled on the carpeted floor; its color is the most vibrant piece of the studio and is reminiscent of the seascape she is drawn to. Kekebanos sees herself as always thinking and easily distracted. Her studio space serves as a portal to get out of her head where she may focus up to five or six hours at a time, with intervals to eat, rest, or (in times of anxiousness) practice yoga. The overall lightness to the room was quite calming. A single gessoed canvas hangs against the plastic sheet. It is bare. Marianna tends to start a painting blank, the stark white staring at us across the room. When asked about the time of day she paints, she smiles and says the morning. She does not consider herself a morning person, but when she wakes early to see the sun beaming into the studio creating a bright light in the room she is determined to become one. The bare bones of the room allows for a “fresh" start to each image. In the past she has used collage elements as a way to experiment with ideas before translating them onto canvas. At the moment, she references found photographs posted online. She is interested in sea creatures such as the spaghetti worm as a loose visual to paint from. Kekebanos is not appeased by these source images and if able would love to travel back to Greece and photograph the sea life herself. She is uninterested in representing these organisms in their whole form. She loves the play and freedom that working in abstraction allows--creating an imaginative body of floating figures. Her attraction to setting up a quiet and clean work space not filled with past works or even ideas of future ones not only helps her concentrate, but bares a strong connection to her roots. When speaking about her childhood she laughs, mentions her love of grilled octopus, and recounts her memories of collecting sea shells and rocks, basking in the sun, and playing on the rooftops. She emphasizes her love of balconies and their ability bring together a community. People often sip Greek coffee and lounge as they overlook the landscape. Schedules and deadlines are let go, minds are at ease, and the worry about the past and future drift off, replenished by a focus on living in the present.